An eye-catching, floral and heart art glass table lamp with a traditional appeal. Light up any corner with this Tiffany style table lamp. The dark brown design features ornate floral details at the base. 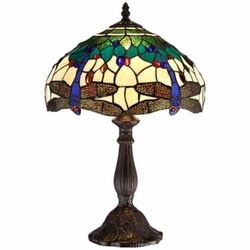 The colorful dragonfly art glass shade features a warm combination of green, brown and ivory to complete the look. • Dragonfly art glass shade. • Cast resin and glass construction. • Shade diameter is 12".